Enjoy a holiday in one of Germany's most beautiful and enticing upland regions. 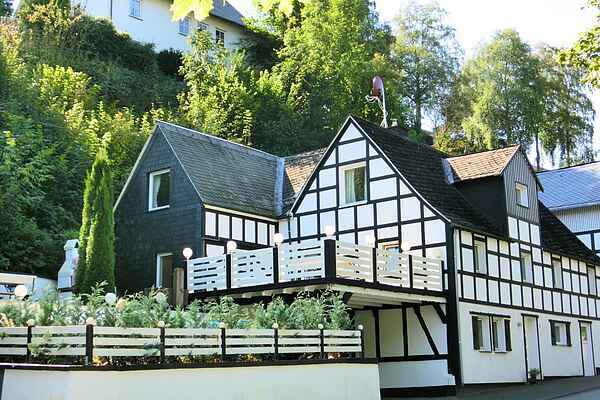 You will find it here in Sauerland, an attractive and varied region of high hills. The little town of Oberkirchen is situated in a tranquil spot at the foot of the Rothaar Mountains. Come spend your holiday in this century-old, traditional half-timbered house in the town centre. This accommodation is a combination of two separate and identical 4-person holiday homes that are directly adjacent to each other on the same floor. You will have this floor entirely to yourself. The holiday home has been recently renovated and is furnished in a stylish design, with four bedrooms, two bathrooms and two open-plan kitchens. The garden and terrace with garden furniture are also at your disposal. The Wanderwelt Schmallenberger Sauerland is right at your doorstep; you can explore the whole region on this network of hiking trails. There are also extensive sport and leisure offerings to enjoy, including golf, tennis, bowling, horseback riding, swimming and much more. The region offers ideal conditions in winter as well, with opportunities for sleighing and downhill or cross-country skiing. The well-known winter sport destination of Winterberg is just 14 km away.